I have heard that art quilts have a mind of their own and can take over their destiny at some point. This is certainly true of my latest piece, Center. The peacock feather came from a fan I received a few years ago as a gift in India. The background is a hand-knit square I made and wanted to experiment with. I used some soluble stabilizer to create the inner border (I will post detail on that on Friday.). At that point I considered submitting the piece for a SAQA exhibit but there was size constraint of an 8 inch square. Center did not want to be an 8 inche square. I put it in a drawer for a bit but it kept calling out for more. Hence, the blue border. And so, Center became my piece for the 3 Creative Studios Quilt Challenge 2010. The word for the July/August challenge was reflection. Center is reflective for me. In the art of aikido that I practice, we speak of having 'one point', a mind/body state of calmness and relaxation. Reflection and meditation contribute to our development of one point. 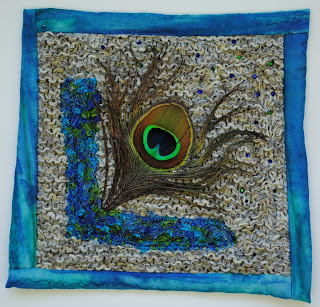 The 'eye' of the peacock feather reminds me of one point. Hi Judy, thank you for the comment on my blog! 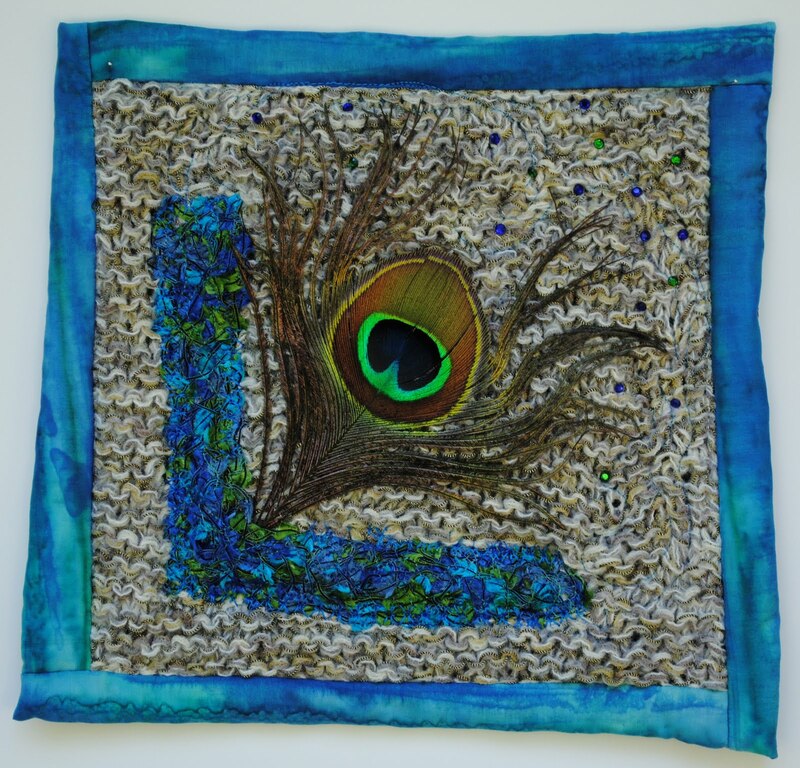 I find it creative and interesting to integrate a knitted piece into your quilt art. You may have started something that would be a series for you.